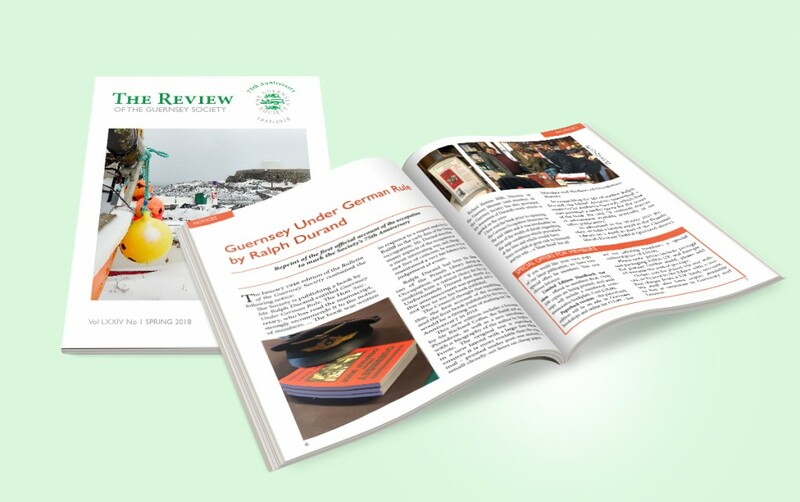 This year marks the 75th Anniversary for the Guernsey Society – and our first edition of The Review includes details of our republication of “Guernsey Under German Rule” by Ralph Durand – the first account of the occupation published by the society in 1946. We also look forward to our celebratory lunch in September with our special guest, Sir Richard Collas, Bailiff of Guernsey and President of the Guernsey Society. Our first Review of the year includes a broad selection of articles – including New Zealand member Bridget Bridle’s account of her long-lost sister, Bruce Parker’s story of an acclaimed Victorian Guernsey daffodil grower, Michael Paul’s account of an aeronautical American cousin and Susan Ilie’s tour of the Lost Chapels of St Sampsons. We also include the Eisteddfod-winning entry to the Guernsey Society trophy for Local Poetry – ‘The Little Aunts’ by Sarah Conlan. Our tour of Guernsey place-names around the world arrives at Guernsey Way in Herne Hill in South-East London, and we reveal a surprising early connection between the island and the John Lewis partnership – predating the arrival of Waitrose by 160 years. As usual, we also include a summary of the latest Island News, Society News and a selection of book reviews. The Review is published three times a year and is sent free to members around the world.